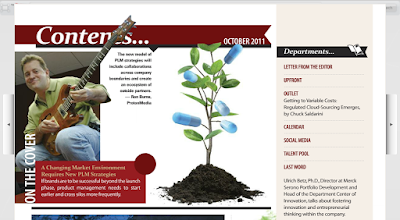 PharmaVOICE's October cover story is worth a read for anyone in life sciences, especially if you're involved in product life cycle management (PLM). The story, "A Changing Market Environment Requires New PLM Strategies," drills into some of the latest thinking and analysis about PLM strategy and coping with the ongoing challenges of pipeline maintenance. 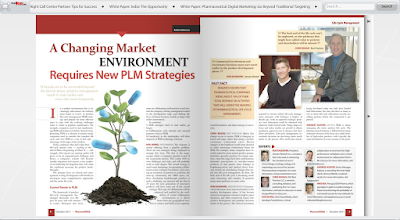 Writer Robin Robinson featured insight from five industry sources, including Rob Bazemore, President of Janssen Biotech; Chris Bogan, CEO of Best Practices; Andrew Hunter, Senior Manager of Kalypso; Mike Rea, CEO of IDEA Pharma; and yours truly. I encourage you to grab a copy of this month's PharmaVOICE or flip over to the digital edition (page 8) to read the piece. Find out the three major themes Robin distilled from our collective insight, and what it means for your PLM strategy as we prepare for 2012.